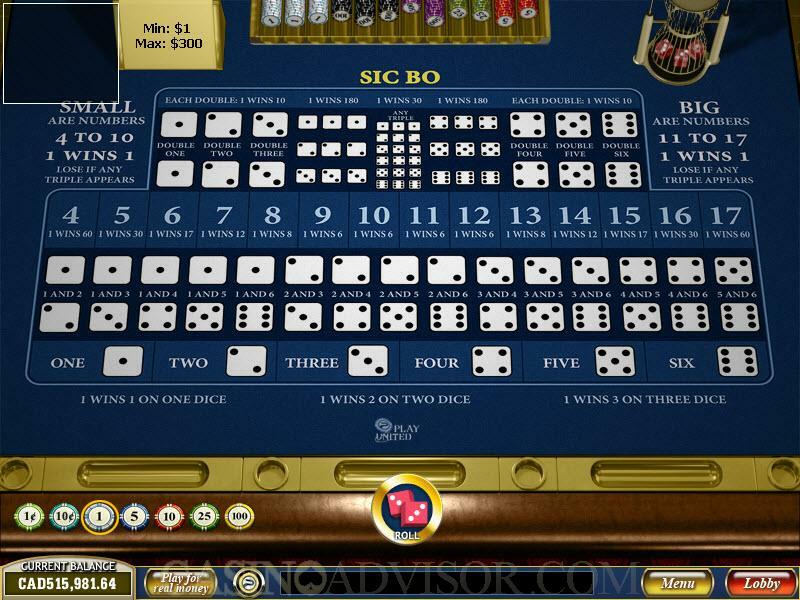 Sic Bo is played with dice, just like Craps. 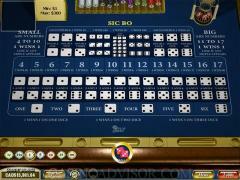 However unlike in Craps, all Sic Bo bets are decided in the given roll. That makes Sic Bo much easier to understand. The screen can be divided into three parts. On the top the dice are rolled and the Small and Big bet histories are tracked. The large central part has the Sic Bo layout where the bets are placed. The bottom part is from where the player operates. On the left the different chip denominations are shown. The chip size ranges from 0.01 to 100. The Rebet, Roll and Clear Bets buttons appear in the center. Right at the bottom is the toolbar. On the left in the toolbar the player’s current balance is displayed. Next to it is the option to switch to real money wagering. The Playtech Sic Bo layout can be divided into four horizontal layers. In the top layer are the Small and Big bets and the doubles and triples bets. In the second layer are the bets on the total of the three dice. The totals on which wagers can be placed range from 4 to 17. The third layer contains the various two dice combinations and the bottom layer contains the one die combinations. The game begins with the player selecting a chip denomination and placing a wager by clicking the desired bet area in the layout. The payouts are marked on the betting area. Players must keep in mind that the minimum wager is 1.00. The maximum wager of 300.00 applies to even money bets only. The higher paying bets have lower maximum bet limits. Unfortunately the maximum bet limits for the different bets are not displayed. Only when the wager placed is higher than the limit does the software indicate the limit. Players can place multiple wagers. After placing the wagers if the player wants to change his wager he can click on the Clear Bets button and clear the layout. Alternatively he can remove single chips by right clicking on them. If he is satisfied with the wager he can click the Roll button and see the outcome of the dice in the top right corner. All the winning bet areas are highlighted for the player’s convenience, even if they do not have wagers on them. The winning bets are instantly paid of and the layout cleared. If the Dealer’s Voices have been enables the dealer announces the wins. Then the Rebet button is displayed. If the player wants to place an identical set of wagers he just has to click on the Rebet button. Otherwise he can place wagers as described earlier. There are no marked areas for the bet amount and the won amount. These are displayed just below the layout. As the players add more wagers the bet amount increases. After the roll the total won amount is shown and the player’s account is credited. The only statistics displayed are the history of the Small and Big bets. These are displayed on the screen. There is no Statistics tab that tracks the statistics of the other outcomes. Interested in reading more detailed information about Playtech Sic Bo? If so Click Here for more details.